When I think of Michael White, I think Italian. It’s a word association as natural as David Chang and Asian fusion and of course, Wylie Dufresne and gastronomy. After all, chef Michael White has really left his mark all across town from the seafood mecca Marea to the elegant Ai Fiori to approachable Osteria Morini to even a pizza shop Nicoletta. So I wasn’t quite how to interpret his newest project in Tribeca, The Butterfly Cocktails and Supperclub. The space is small and can be quite boisterous depending on how many are crowded around the bar. Both times I dined there, my companions and I chose to park ourselves at the bar instead of waiting for a table. Despite having to shout over the noise from time to time, the service was quick and attentive. A quick look at the menu, you will notice that this was not quite the Italian that we are used to from Chef Michael. Instead, The Butterfly is as eclectic of a menu as it can be with a throwback to diner classics. The nostalgia starts with the cocktail program here. At first glance, these are all names we are familiar with – whiskey sour, mai-tai, martini, Tom Collins. A little boring no? Well not quite. 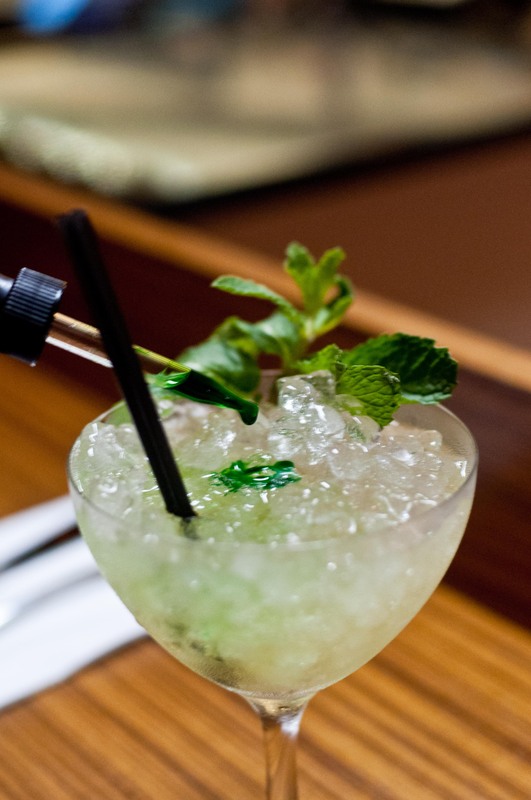 Take the Grasshopper, a sweet minty cocktail often taken as an after dinner drink. They made it special by using a creme de cacao made with real cacao and a creme de menthe created with real mint instead of extracts. At The Butterfly, you can enjoy the Grasshopper green or white. When the waitress brings you your grasshopper, she will also place a little bottle of pandan next to your drink. She or he will instruct that you take a sip of the drink as is and then add a few drops of the pandan which will turn the drink a bright green and impart an almond flavor to the drink, making it less sweet and more nutty and more well rounded. Fun right? For something a little less girly, the Boilermaker is also another hands on cocktail. 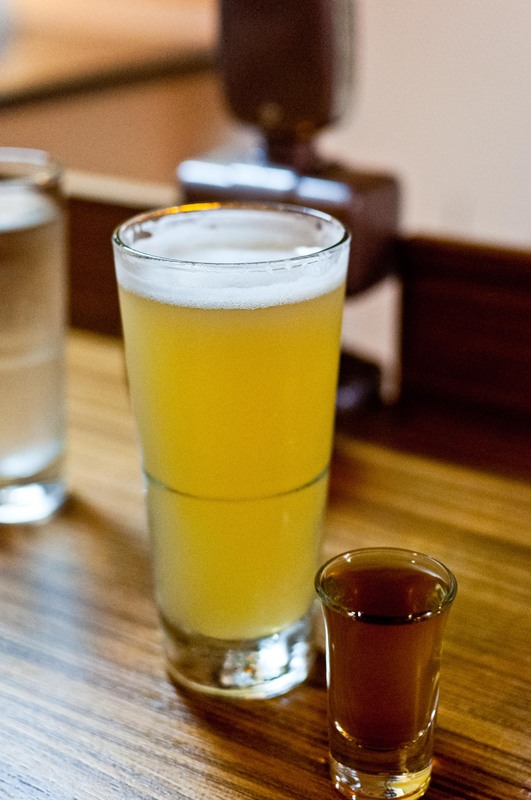 A tall glass of raisin shandy is served with a shot of pumpernickle dewar scotch shot. Take a sip of the shandy, the waitress will instruct you, and then a sip of the scotch. Then, when you have enjoyed enough of the shandy to make room for the scotch, feel free to toss the entire shot in the glass and enjoy. The raisin shandy is made with a raisin soda that is served also on draught and Birra Morini oregano lager. The shandy was so delicious and refreshing that I ordered a glass by itself during my second visit. In addition to the cocktail menu, The Butterfly also offers an unique list of soft drinks on tap, including a bold smoked coke. This is not a shy drink. 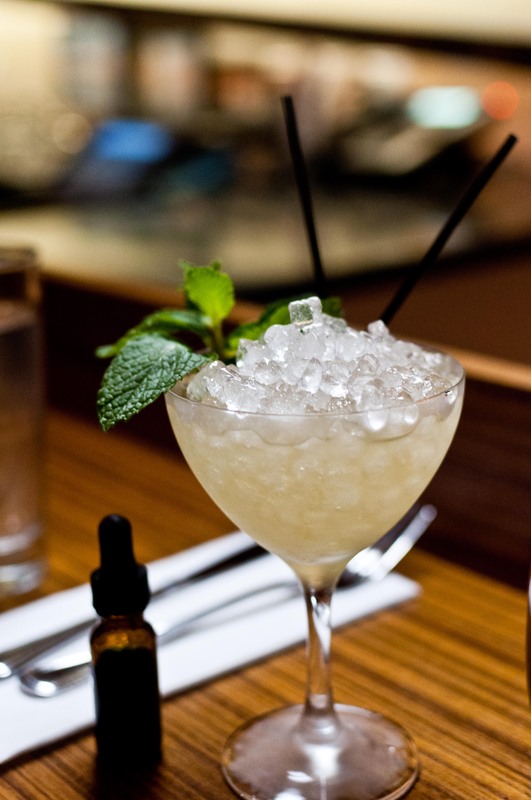 In fact, one sip and you will immediately notice every bit of that smoky flavor imparted throughout the drink. It’s like having a coke and BBQ at the same time as AD commented. 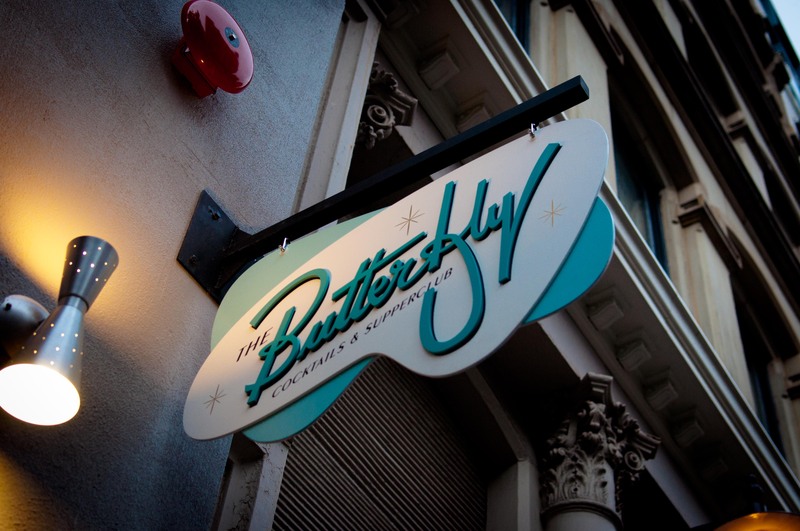 The menu at The Butterfly is centered around a tight list of entrees and a well developed list of appetizers or hors d’oeuvres as they are referred to here. 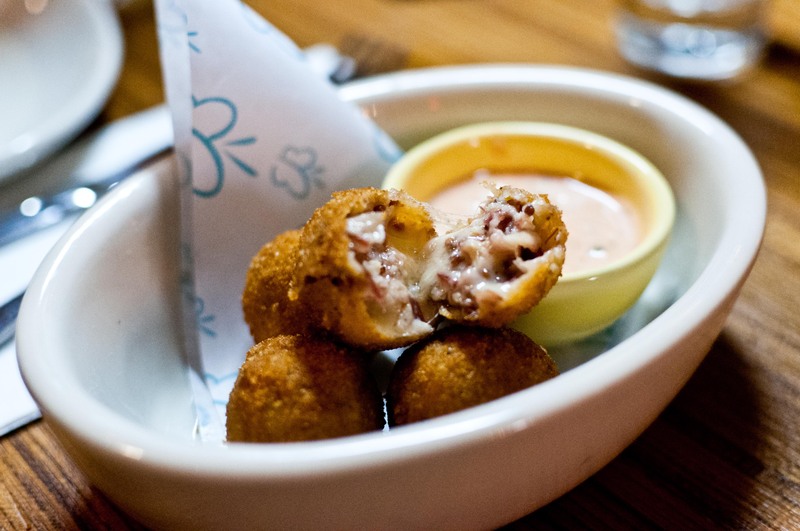 A must have are the reuben croquettes. 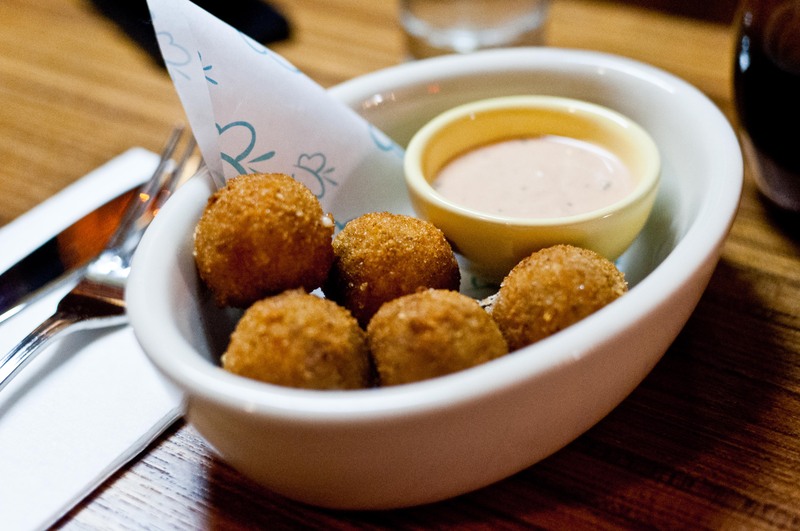 A shout-out to the old New York, these little bites are made with corned beef from Katz’s Deli and sauerkraut and a rye Thousand Island dressing. These little golden orbs are crunchy on the outside and one bite will reveal little nuggets of the salty corned beef studded throughout. 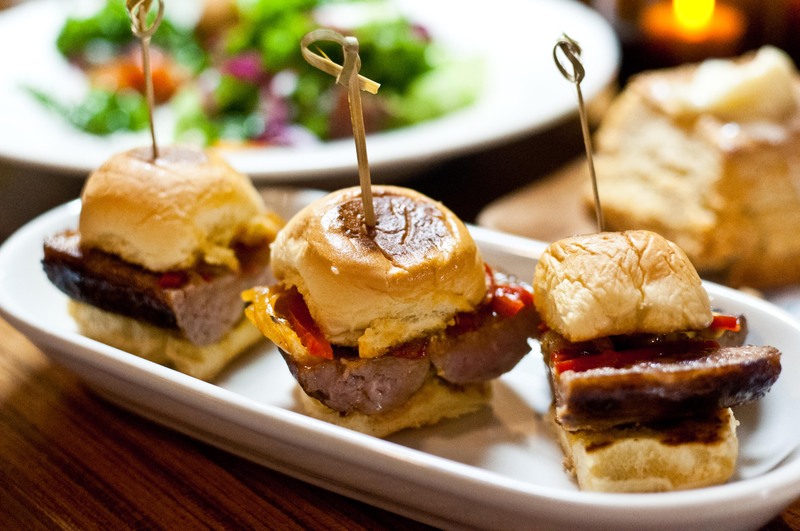 The bratwurst sliders are as cute as they are delicious. Juicy homemade bratwurst is crispy on the outside and tucked into soft potato buns with a smear of spicy mustard and sweet pepper relish. One bite or two, they are the perfect party food and will disappear as quickly as they come to the table. One of the most interesting sounding things on the menu that caught my eye is the shrimp toast. 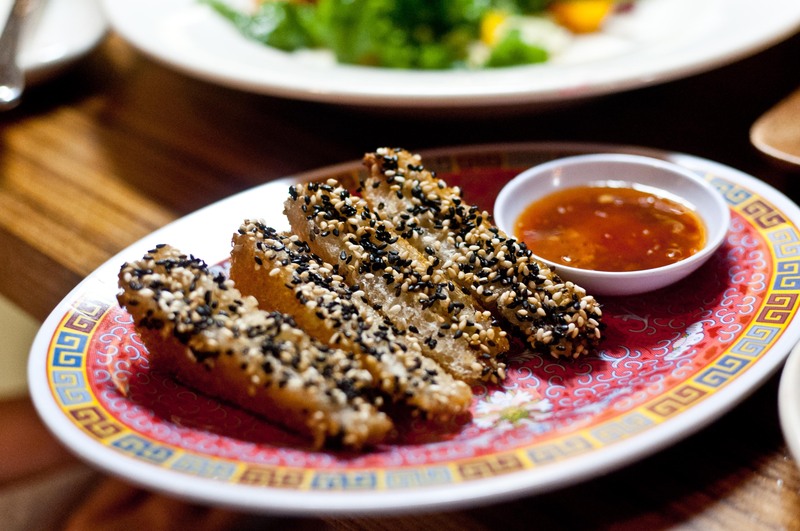 Served with a sweet and sour duck sauce, the little triangle sandwiches are stuffed with a ginger and shrimp puree and is fried until crunchy. I was certainly not expecting what arrived at our table based on the description and while I liked the sweet and sour duck sauce, it had to be enjoyed quickly and was a tad too heavy. And moving onto something a little lighter, The Butterfly offers a selection of salads. I can never turn down a kale salad despite how pedestrian it has become. The version here is named the BLT and consists of a base of sturdy kale and spinach leaves. 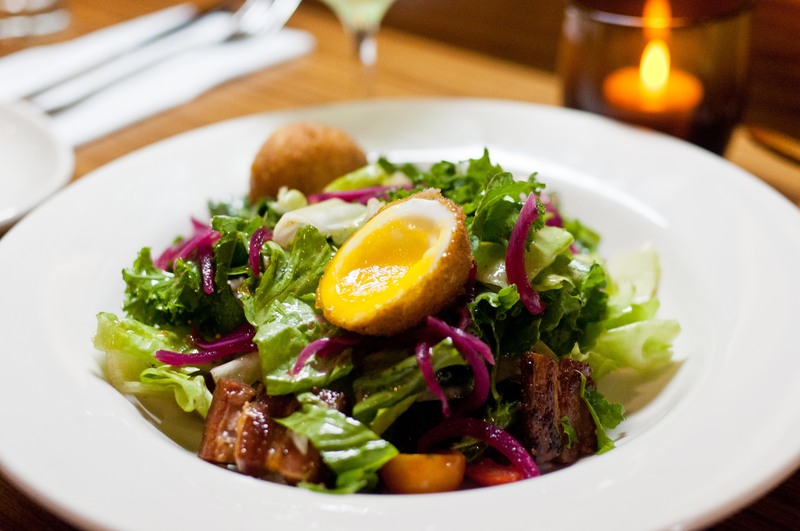 Topped with a golden brown crispy 6 minute egg and fatty Nueske’s bacon, this is all tossed with a sherry vinaigrette dressing to lighten everything. Can I have a little more egg please? They are definitely the star of the dish. And now, onto the main dishes. 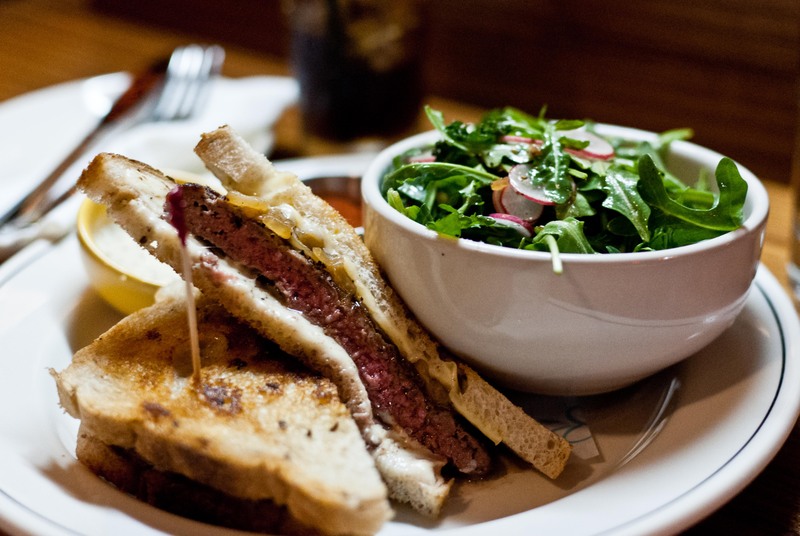 The patty melt might sound a little low brow but this version here is made with some very quality dry-aged beef and a blend of Swiss and American cheese and fried onions. The caraway rye holds up to the juicy flavorful beef and a dip of a spicy mustard served on the side cuts the richness and adds a great spicy punch. Instead of fries, you can opt to substitute for a bowl of delicious spicy arugula salad with shaved radishes. 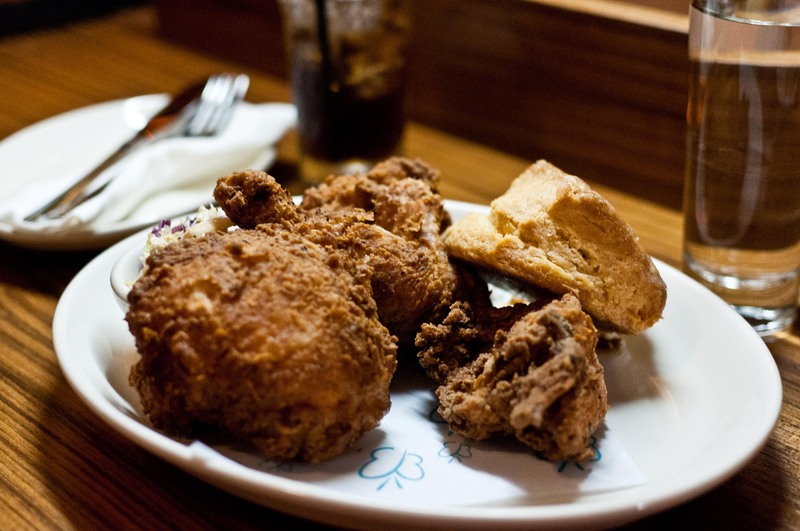 And who can resist fried chicken? Three pieces of crispy juicy Bell and Evan’s chicken here are served simply with a little bowl of cole slaw and a flaky biscuit with honey butter. I suggest forgetting about the cole slaw and focusing your energy on the delicious chicken and the amazing biscuit. I know we did. 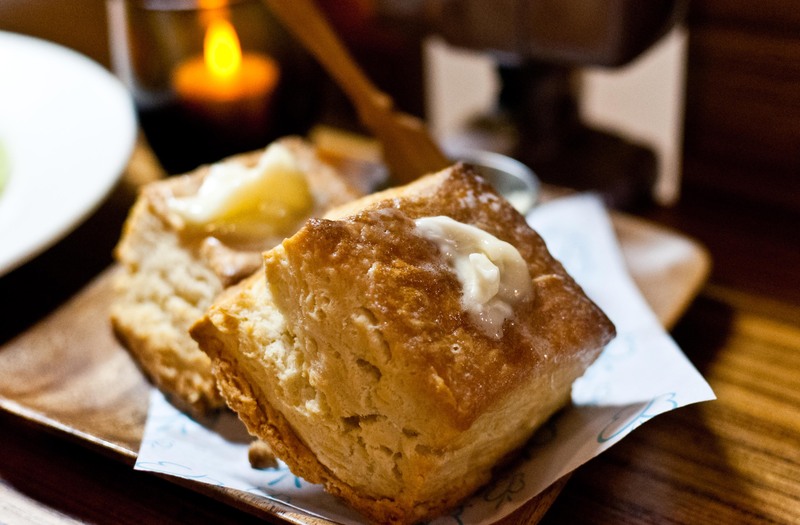 And did I mention how amazing the biscuit is? In case you didn’t realize how good they are, you should pay attention because they are fantastic. And the best part is that you can order them as a side and instead of one, they come two to a serving! Slathering on the soft honey butter onto the top of the warm golden brown biscuit and watch it glisten. Then, you should proceed to keep buttering each layer as you tear off them off one by one. That is how these should be properly savored. Finally, if you have room for dessert, The Butterfly offers some pretty awesome takes on classics. 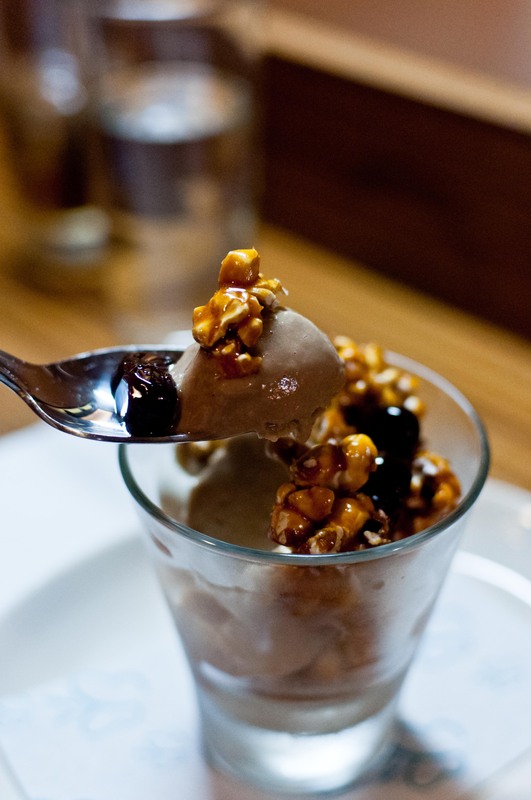 The coppa cola is a little parfait that uses a beautiful coca cola ice cream as the base. 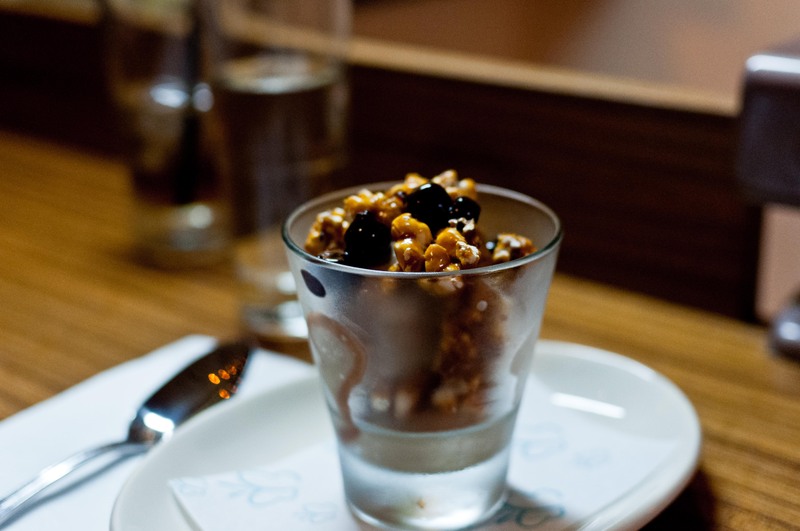 Topped with caramel popcorn, whiskey cream, this is finished with amarena cherries. After all, everything is better with a little cherry on top, right? This is a great choice for someone with a sweet tooth. 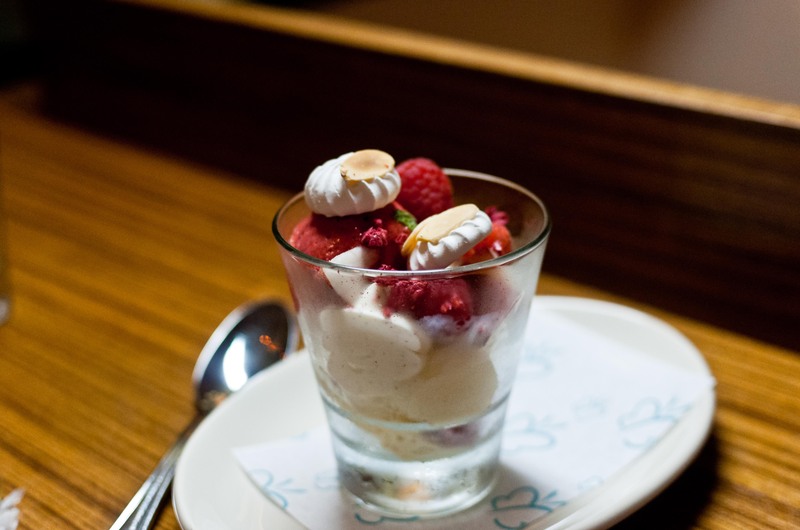 And for a sweet finish that is a little lighter, the Melba is the way to go. 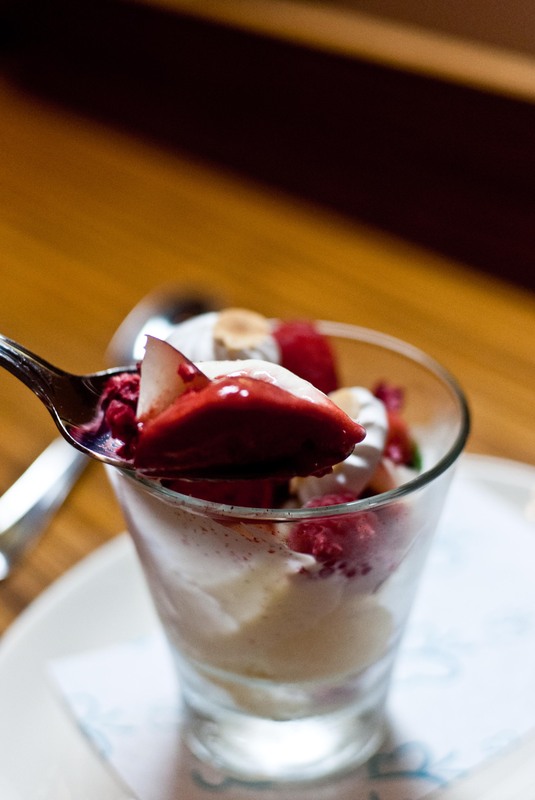 A combination of peach ice cream and raspberry sorbet screams summer. A few adorable meringue drops, almond cake and some sweet cream add texture without heaviness. This is summer in a bite. A meal at The Butterfly will be nothing short of amazing but it will also be something completely different than any of Michael White’s other establishments. Even though I utterly love the pastas at Marea and Osteria Morini, I am glad to see that the chef’s newest venture is embracing Americana. How wonderful does a meal with a glass of icy cold raisin shandy, reuben croquettes with a patty melt and some of those fantastic biscuits sound? So good that I can run downtown right now. Who wants to join?